Shoulder Pain is really common nowadays which has many causes attached it. This might happen due to injury, long sitting hours, wrong sleeping position etc. Shoulder part is really sensitive with several joints combined with muscles and tendons that allow movements of arms effortlessly. Sometimes shoulder pain occurs from arthritis, Calcific Tendonitis, Tendinitis, Instability, Tendon Tears etc. This kind of severe pain also leads to many other health issues like body pain, neck pain, headache etc. Bursae are tiny, fluid crammed sacs that are positioned in joints all through the body and the shoulder. This act as a pillow between the bones and soft tissues that help reduce the resistance between the gliding bones and muscles. However, extreme use of the shoulder causes swelling and inflammation between the rotator cuff and shoulder blade. Bursitis often occurs in connection with rotator cuff tendinitis. The tissue in the shoulder becomes painful and inflamed. Using a supportive pillow such as shoulder memory foam pillow helps to reduce the pain and creates a personalized fit. A tendon is a string that joins muscles to bones. Most of the tendinitis is a consequence of inflammation in the tendon. The most commonly caused tendons in the shoulder are one of the biceps tendons and four rotator cuff tendons. The rotator cuff is a combination of tendons and four tiny muscles that envelop the head of the upper arm bone and upholds in the shoulder socket. The right sleeping shoulder pillow suitable to your sleep position is the orthopedic therapy for shoulder pain relief. Tearing and Splitting of tendons might cause acute degenerative or injury in the tendons. The tears might be fractional or may totally separate the tendon from the part to bone. In some cases of total tears, the tendon is dragged away from its connection to the bone. Biceps tendon and rotator cuff injuries are the most common injuries. It is recommended to consult the orthopedic doctor before it gets critical. Infused gel memory foam pillow is ideal for the one with such pain because it promotes better breathability. Shoulder impingement causes when the peak of the shoulder blade puts extra pressure on the fundamental soft tissues when the arms are elevated away from the body. This can lead to tendinitis and bursitis, causing pain and restrictive movement. Shoulder pain is also caused by wrong sleeping position and the wrong pillow that twists the muscles wrongly and causes severe pain. Bamboo pillow with an Eco-friendly and hypoallergenic pillow is perfect to get relief from such shoulder pain. Shoulder pain is also caused by arthritis. The common symptoms of arthritis shoulder pain are swelling, numbness, severe pain, and stiffness, typically. Osteoarthritis might be related to excess works, sports or chronic tear. Other types can be related to infection, rotator cuff tears, and inflammation of the joint lining. This also sometimes leads to stiffening or tightening of the soft tissue of the joint, causing in a painful limitation of motion. It is always suggested to consult the specialist doctor for complete relief and also needs the support of a shredded memory foam pillow. For more support, reach out to Sleepsia! Shoulder pain is caused due to various reasons which increase with time if not properly taken care of. Along with the proper treatment for the hysicians, it’s also essential to invest time in selecting the right orthopedic pillow. 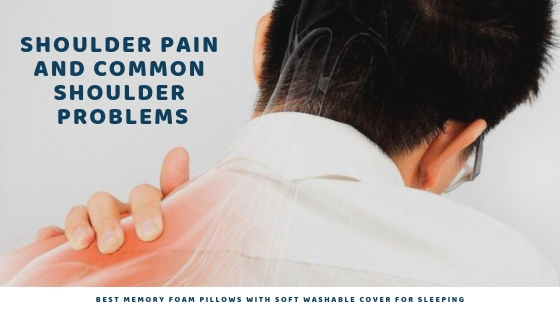 Sleepsia cares about your comfort and pain-free sleeping experience, thus, it believes in delivering premium quality memory foam pillows across the USA. You can undoubtedly purchase Sleepsia products by visiting the official website www.sleepsia.co, identify the pillow that suits you and place an order. ← Sleepsia Ventilated Memory Foam Contour Pillow: Boost Better Breathability!